Baltic Amber Rosaries There are 8 products. 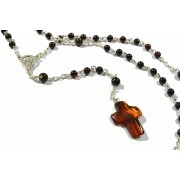 Christian Rosaries made of Baltic Amber can be a great religious gift for anyone. 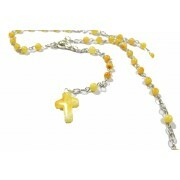 In TheNaturalAmber.com website we offer 4 different design Catholic rosaries. 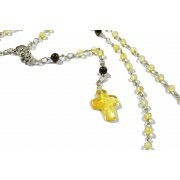 Beads and cross in this rosary are made from genuine Baltic Amber. Each of our rosaries come together with a certificate that Amber used when making them was genuine. Available colors for Christian Rosaries are cherry, lemon, milky, honey and combinations of them. Each Rosary weights on average 14 grams and beads in it are paired with metal loops. Minimum order quantity for wholesale clients is 5 rosaries and single rosaries can be ordered too. Product ID: RSY03; Short Description: Natural Baltic Amber Christian Rosary. 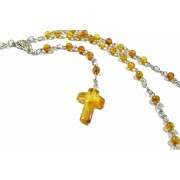 Amber beads in this rosary are combined with metal loops and on the bottom there is a cross made of honey Amber. Beads Color: Honey;Cross Color: Honey;Rosary Weight: ~14 g.
RSY04 Christian Rosary made from Natural Baltic Amber Amber beads coupled metal loops and on the end is Natural Amber crosseBeads color: mat/milkyCrosse color: mat/milkyRosary weight: 14gr. 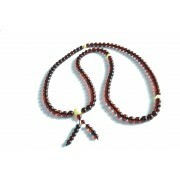 Product ID: RB001; Short Description: Buddhist 108 Beads Natural Cherry Amber Necklace; Color: Cherry; Amber Beads: Polished; Other Information: This necklace is made on Dark Elastic Band; RB001-1 Weight: ~21 grams; Size of Amber Beads: 6-8 mm; RB001-2 Weight: ~45 grams; Size of Amber Beads: 8-10 mm; Length: ~98 cm (basis) + 5.5 cm. Product ID: RB002; Short Description: Buddhist 108 Beads Butter Amber Necklace; Color: Butter; Amber Beads: Polished; Size of Amber Beads: 6 mm; Necklace Weight: ~16 grams; Length: ~68 cm (basis) + 3.5 cm. 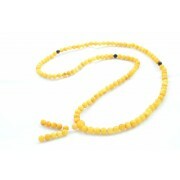 Product ID: RB003; Short Description: Lemon Amber Tibetan Buddhist Mala Prayer 108 Beads; Color: Lemon;Weight: 13 grams;Size of Amber Beads: 4-6 mm; Amber Beads: Polished; Other Information: This necklace is made on White Elastic Band; Length: ~60 cm (basis) + 3 cm. Product ID: RB004; Short Description: Buddhist Prayer Baltic Amber Rosary, Milky Color; Size of Amber Beads: 5-6 mm; Amber: Polished; Weight: ~20 grams; Amber Beads: Round; Color: Milky; Length: 74 cm (basis) + 5.5 cm.